The 16,000-sf, pebble-shaped Chinatown Branch Library was built at the intersection of new and old Chinatown neighborhoods. The goal is for the building to unite the communities and serve as a catalyst for the developing area. One of Chicago’s most significant architectural additions in 2015 was not a booming high-rise at the center of the Loop or a grand new park along the lakefront. It was a small, pebble-shaped, glass-and-steel library that serves as the new beating heart of two neighborhoods on the city’s South Side. 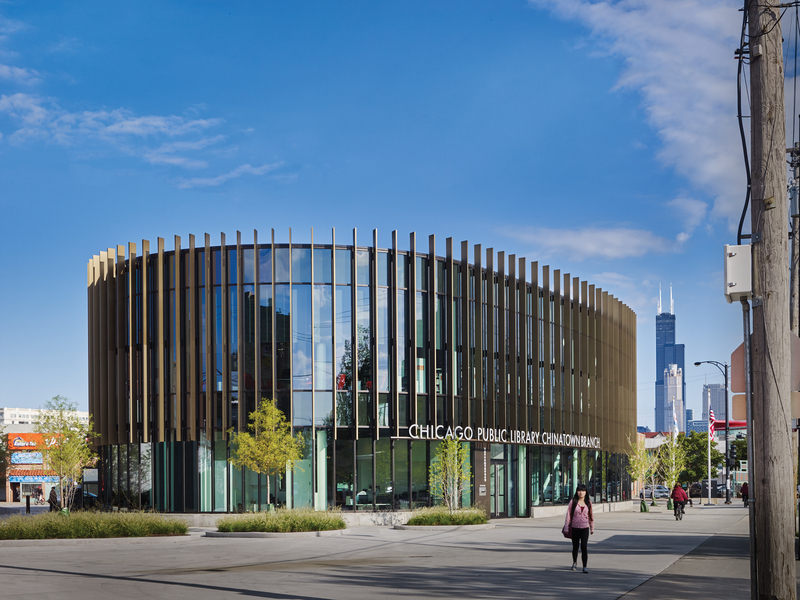 The 16,000-sf Chinatown Branch Library is strategically placed at the nexus of Chicago’s historic southern and emerging northern Chinatown neighborhoods—the intersection of Archer Avenue and Wentworth Avenue—with the goal of uniting the communities and serving as a catalyst for the developing area. It provides much needed public spaces—indoor and out—for the neighborhoods, and makes a bold architectural statement in an area that is rich in tradition. The library’s ovate form makes the most of the prominent, yet oddly shaped site. It adheres to Feng Shui principles by matching the existing alignments of the adjacent streets without creating aggressive corners, and is designed and sited to anticipate a future realignment of Wentworth Avenue that would encroach onto the site. To reinforce the concept of the library as a civic, educational, and social hub, the Building Team wrapped the structure in an ultra-transparent glass curtain wall, which extends the full height of the two-story structure. With minimal interior walls, the library offers patrons panoramic views of the surrounding neighborhood. Likewise, passersby can see deep into the first floor of the library, especially at night, when the building glows like a beacon. The interior spaces are situated around the library’s central atrium, which functions as a lounge, exhibition, and pre-function space, and features a curved staircase and a single skylight oculus and reflector above. Directly behind the staircase is a glass-walled, multipurpose community meeting room that is used for lectures, tutoring, quiet reading, lounge space, musical rehearsal, and special events. Acoustical curtains divide the room into smaller areas, and a double-door pantry allows library staff members to serve beverages to both the meeting room and the entry lobby. The first floor also houses the children’s reading area. The adult reading area and teen spaces are on the second level. Throughout the library, acoustical fabric screens provide definition and separation when needed. Furnishings and book storage solutions, including eye-height shelving and community worktables, are arranged in a variety of configurations to accommodate multiple uses, informal collaborative areas, and intimate reading options. To keep costs within reason, the Building Team created a highly flexible, open-plan interior scheme, which eliminated excess circulation spaces, single-function rooms, and non-assignable areas. This allowed the team to downsize the original program from 20,000 sf to 16,000 sf. Also, where possible, the team utilized off-the-shelf materials and systems—for example, the simple yet elegant vertical fins for solar shading, and the radiant mat heating/cooling system suspended from the metal decking, which doubles as a ceiling system—to create a truly one-of-a-kind structure without the exorbitant costs associated with a customized approach. Since opening in late August 2015, the library has quickly become a new gathering place in Chinatown. In the first four months of operation, more than 95,000 visitors checked out some 55,000 items from the branch, an increase of 28% and 70%, respectively, compared to the same time period in 2014 at the previous facility. Furnishings and book storage, including eye-height shelving, are arranged to accommodate multiple uses, informal collaborative areas, and reading options. Photo: Jon Miller, Hedrich Blessing. Click to enlarge. The interior spaces are situated around the library’s central atrium, which functions as a lounge, exhibition, and pre-function space. Photo: Jon Miller, Hedrich Blessing. Click to enlarge.